Defender Matty Pearson couldn’t hide his frustration that the Hatters didn’t take the chance to increase their lead over the chasing pack by a bigger margin on Sunday when drawing 1-1 with Coventry. With Barnsley holding Portsmouth to a goalless draw the previous day, a win for Luton would have seen them go seven clear at the top. It’s good to have unbeaten records, but we are disappointed with how it finished, as we wanted to win. They looked well on the way to achieving that when Pearson nodded home a 17th minute opener, but Coventry hit back to level and then hold on for a point in the second period. 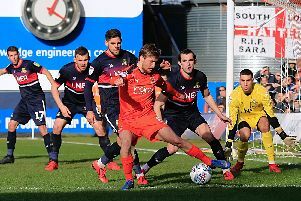 Although it extended the Hatters’ unbeaten record to 21 games, Pearson said: “I’m disappointed, it feels like a loss, but probably all in all it’s a good point. “If it had been different circumstances we’d have been happy, we’ve got to be happy. “You want to be winning games though, you want to be making the gap even bigger. Third placed Sunderland had made it back-to-back wins by beating Bristol Rover son Saturday, and are now just seven points adrift with a game in hand. The Black Cats were on a run of three successive draws at one stage, but Pearson always felt they would come good. Town had chances in the second period to triumph, with Pelly-Ruddock Mpanzu wide, Andrew Shinnie seeing a shot deflected off target and then Alan McCormack shooting straight at keeper Lee Burge from close range. The centre half continued: “Second half, I can’t even remember them having a shot or anything at our goal. He added: “It’s frustrating for him isn’t it, but that’s the way it goes.